Let me begin this post with an apology to Jenny. She has waited so patiently for pictures of my trees, and I know she’d really rather see the exotics I purchased recently. 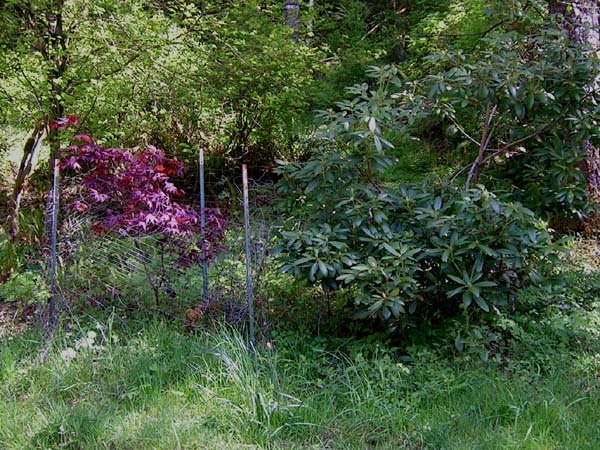 But Jenny, by the time you asked for pictures, most of them were already planted, and being a foot or so tall in their great big anti-beaver wire cages, there isn’t much to see. I tried to take some pictures, and even I went “ho hum” at the results. However, I am going to post some pictures of a few more mundane varieties and hope they aren’t as mundane in New Zealand. And what these trees have in common is that they were each basically sticks a foot or less tall when I planted them. So I have great hopes for my new ones. This Western Red Cedar was my first “rescue” effort. I rescued it from an office building landscaped lot. It was a volunteer from God knows where. There weren’t any cedar trees in the immediate area. I looked at it and realized that the maintenance crew was just going to yank it out next time through, called the management company and asked their permission to dig it up. Granted. It’s now about 14′ tall and very pretty just off my back deck. 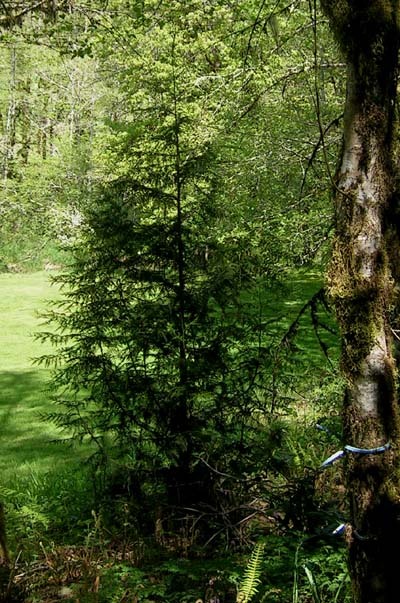 Western Red Cedar is what is known as a “climax” species. 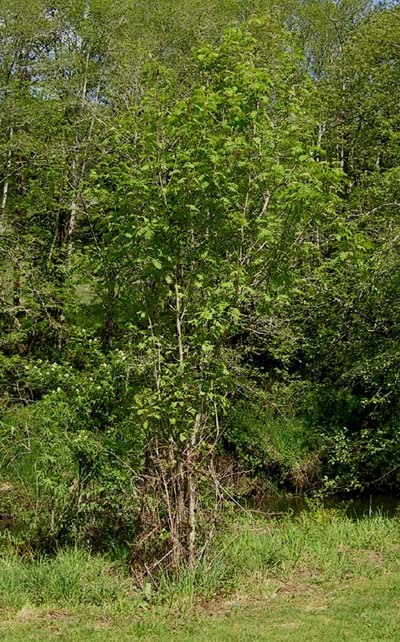 It will grow in virtually total shade and eventually take over the forest. Before the big fires of the 19th and 20th centuries, much of western Oregon was covered with giant cedar trees. This mountain ash was a seedling from a tree in a house we once owned. 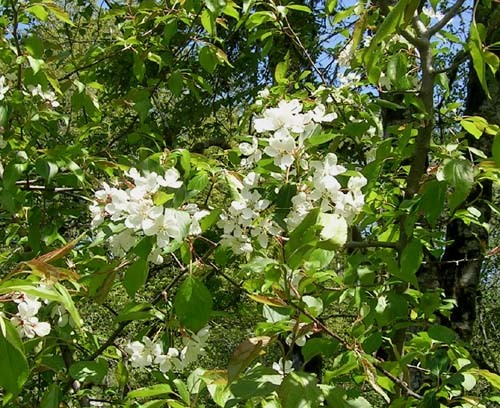 It is now nearly 20″ tall and has beautiful white flowers in the spring followed by brilliant red berries. This is a redbud tree (actually two planted in close proximity). The Arbor Day Society sent me this one when I sent them a teeny bit of money. This Japanese red maple is a very slow grower. I took three seedlings from a house we lived in. The tree there had been planted when the house was built about 90 years ago and was nearly as big as the house. A friend called it “the sort of tree you would buy a house just to get.” That’s pretty much how we felt about it, too. This tree opens a purple red, gradually becomes green and bronze, and in the fall turns neon red. It is truly spectacular most times of the year. There are lots of reasons I’m feeling very friendly toward trees today. Not the least of them is that I’ve spent most of the last three days gardening. Ben tilled about half the load of BS into the garden. I got all that stuff I bought planted, and it’s supposed to rain tomorrow, so I actually put some seed in the ground, too, so nature can water it for me. As I was cleaning up, Ben showed up with some dahlia tubers that a neighbor sent down, so I had another 45 minutes or so of planting and digging to do. I’m dog-tired, and I can’t help but contrast the amount of work the garden takes to get a great reward with the teeny amount of effort it takes to grow fine trees here in my sub-tropical rain forest. But now I read that planting trees in the northern latitudes actually contributes to global warming because they absorb sunlight. I’m going to ignore that little piece of information and keep planting them. Oh, and one more reason to like trees: Last winter we had to take down some of the fir trees Ben planted more than 30 years ago. They had taken out the power lines (we don’t care, but the rest of the valley sure did) and were threatening the little cabin across the river. A logger friend came down and cut them for us. The power company repair crew offered to knight him. Today the company that bought them picked them up to take to a mill. These are the first trees Ben has logged that he actually planted. It was a full truckload. Things are very odd around here right now. Our spring has become much more silent. A post or two ago I was rhapsodizing over the appearance of a bird we believe is a merlin, a species of falcon. This bird preys on other birds. It likes to pluck them right from the air or from the ground where they are feeding and devour them, leaving only a pile of feathers for evidence. And there are plenty of feather piles around the meadow. Result: Most of our birds have moved out. The flock of juncos that hung around the yard have disappeared. I haven’t seen the kinglets all week. The robins, newly back from their winter residence, have done the same. The hummers are fine. I suspect they’re not worth fooling with. As Ben is fond of pointing out, it would take at least 1,000 hummers to make a decent hummingbird tongue sandwich. . .
My prediction: As his food supply dries up, the merlin will move on. Then the birds will come back. We have one of the last largely undisturbed good-sized parcels of property in the area. The birds love that, and they’ll be back. But in the meantime it’s weird. For those of you who think nature is largely kind, serene, and beautiful, well, all I can say is that you’ve probably never lived with it. I just hope the merlin likes squab and sticks around long enough to lay real waste to the pigeons. We don’t use poisons and such. You just need to find the right natural antidote to whatever is causing you grief. 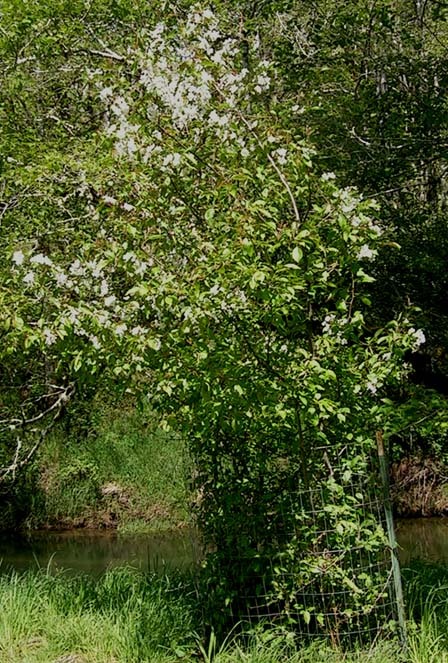 But spring keeps on springing–trilliums poking up everywhere, today the Solomon’s seal is up in my back yard, a real (purple, not the yellow “wood” kind) violet is blooming in the backyard, the plum trees in blossom. It’s lovely. But I’m missing the plethora of songbirds. Yesterday I was treated to the non-stop operation of two brush saws for several hours. Ben and Ralph were clearing the salmonberry and ferns that shelter the rodents that do so much damage. If we eliminate their cover, our owls will take care of them for us. The guys made a heck of a mess, but I’ve put my trusty new pink rake into action, and it’s getting cleared away. Unless something untoward happens, I’ll be MIA tomorrow. I’m going to take a run up to Portland for an evening meeting, spend the night at my daughter’s house, visit the tax man on Wednesday morning, then go on a profligate shopping spree at Kitchen Kaboodle and New Seasons. I have a long list, and the advantage of going to the store instead of the Web site is that you never know what else you might find. I’ll stop on the way to town for a visit with my brother and his wife. His interim radiation treatments (to try to shrink the size of the tumor and relieve his headaches) start tomorrow morning. I know he’s feeling housebound after being so active, so I’m taking him my Gibson Hummungbird guitar to fool with. I play my little Guild F20 when I play anymore, so maybe this will take his mind off some of the ugliness. He heard from the Boston hospital and they’ve told him to sign up as a patient. Then they mentioned that they’ve lost all his records and need to find them so they can do the evaluation. As Ralph says, there’s never a sense of urgency unless you’re the one who’s dying. So it looks like a trip to Boston may be in my near future. It’s probably my favorite city in the U.S., but I’d rather be going for different reasons. Now it’s time to get the heck off of here and go put the vegetables in the pot roast. The bread is cooling on the rack. 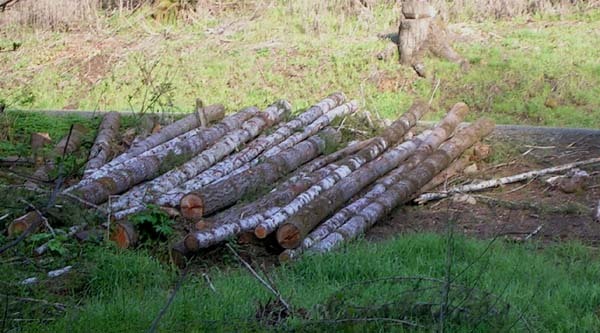 You are currently browsing the archives for the logging category.